The holidays have arrived, and with them an increased number of family gatherings. Our families have the power to trigger our wounds and inadequacies at the best of times, but for women trying to conceive, this time of year can be a minefield. Either you’re spending that holiday dinner averting your gaze from all the babies your cousins are producing, or you’re trying to avoid a tête-à-tête with Great-Aunt Annie and her constant badgering about when you’re going to get moving on starting your family. So what can you do to feel more empowered, more centered and calm, before you walk into these potentially triggering scenarios? So, do you have any plans….? Better get busy, that clock is ticking! You guys do want kids, right? Whether nosy or well-meaning, people feel like they have the right to ask. We don’t want to get defensive and say, “it’s none of your business,” but we also may not feel comfortable opening up with the whole story. I’ve found that taking time beforehand to think through what you want to say can make a huge difference. Most of us spiral into fear and loss at these kinds of questions, which is why it’s important to prepare for and even practice how you’ll respond. Talk to your partner about ways to handle it together. You should be a team, both of you agreed upon your response, so that if you get tongue-tied he knows what to say and vice versa. He has your back and you have his. This can be really unifying for both of you. In general these kinds of questions come from two types of people: the well-meaning person who genuinely wants to support, and the busybody who’s just looking for gossip and likes to know everyone’s business. You may want to have different responses at the ready for each. Most people, thankfully, fall into the well-meaning category. Your mother-in-law who can’t pass up an opportunity to let you know how impatient she is for her first grandchild. The friend who keeps telling you stories of people who adopted and then got pregnant. They really do want to support you but they don’t know how. They may think focusing on the problem is a form of support, but you already spend endless hours focusing on the problem, and you already have your own tape playing in your mind of all the issues and worries—you don’t need more. Since others will reflect back to you what you’re already thinking about, reinforcing either your own worries or your own optimism, when you plan your responses you have the opportunity to start thinking more positively in order to create positive instead of negative energy around you. What you don’t want is for other people’s worries to drag you down even more. If someone says “when are you going to start a family?” and you answer with your energy dragged down low, you’re feeding into your same cycle of fear. The reality is likely that you don’t genuinely feel excited, but to start building up that positivity you can spin your answer in a way that is uplifting for both you and the other person. Do you have one of these in your life? The sister-in-law who seems to pop out babies like candy and is so insensitive she doesn’t even know what’s coming out of her mouth. Your dad’s brother’s wife who’s always railing about women who put their careers ahead of having babies, with pointed looks at you. Regardless of who you’re dealing with, it’s important to make your planned responses genuine so that you can feel in resonance with what you’re saying. Try not to give into the fear. It’s a dangerous place to spiral into, and everybody’s waiting to join you there. It’s your responsibility to bring up your own belief and positive energy and ask people to join you there. 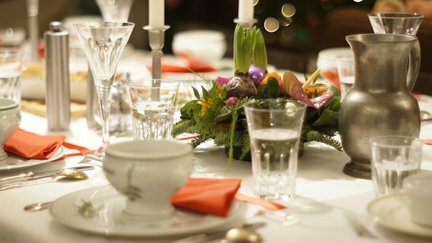 Giving all of this some thought ahead of time can mean the difference between floundering and flourishing at your next holiday gathering. And if you’re finding it really hard not to be negative at this time of year, I have created a step-by-step guide to help you gently move towards better-feeling thoughts. Have you come up with useful responses to these kinds of questions? I’d love to hear your strategy for handling holiday gatherings in an empowered and positive way. Please comment to let us know!